The hype around the startup scene is real, and it may just be the future of Singapore as well as the world. With co-working spaces and startup-centric offices increasingly popping up all over the country, and with bigger companies such as DBS, Paypal and Singtel creating their own accelerators, there is sort of an arms race to uncover the next revolutionary startup that will change the world. And this is even before we include Government-backed incubators, as well as the startup communities found in all tertiary institutions in Singapore. 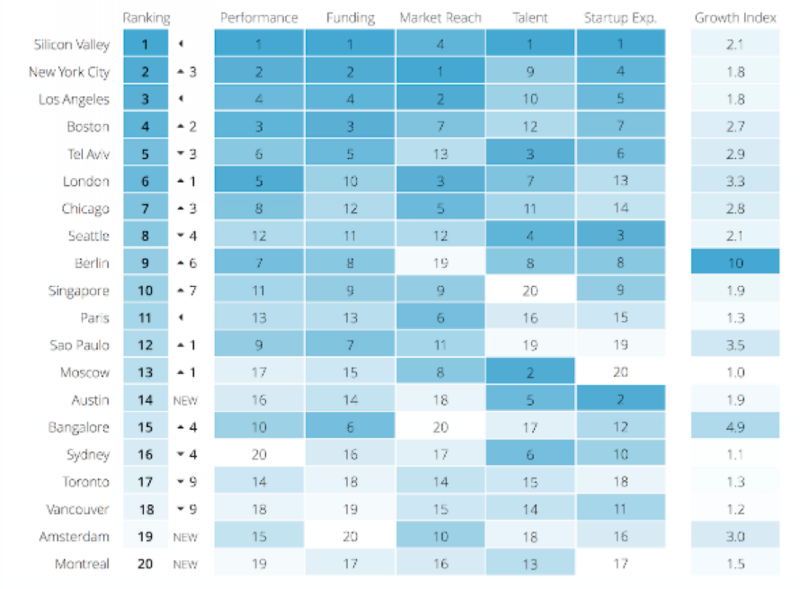 It is no wonder that Singapore is ranked number 10 of the best startup ecosystems in the world by Compass. While the economic outlook seems to suggest a gloomy outlook for the near future, the entrepreneurial and startup scenes are not showing any signs of slowdown, and in fact continue to grow and thrive in spite of the onset of economic uncertainty. You’ve got this big bright idea that you want to execute, and without wasting any time, you founded yourself a startup. You’ve also found yourself the perfect partner to be the co-founder of your startup, and soon enough, the both of you are pitching your idea to investor after investor, in search of funding for your company. Up until this point, like most startup founders, you are probably paying out of your own pocket and eating into your savings, but what happens when you suddenly have funds to manage, and nowhere to put it? Fret not, because we’ve got you covered. Just follow these three steps and you will soon be on your way to better manage your startup’s finances. To get your startup off the ground, you will inevitably need to put up with some overheads. This can come in the form of rental and utilities for your office space, wages for yourself and any staff you may have hired – or even just for the daily operating costs required to run the company. So naturally, you wouldn’t want to break the bank before you even before you get to the bank, to consider opening up a business account for your company. This is where DBS can come in to ease some of those startup woes. With their new Digital Account, you are now presented with a hassle-free way to open a bank account for your startup. Since the account does not require you to have a minimum sum to be maintained in it, it is the perfect choice for fresh startups since cashflow into the company can be somewhat uncertain in the early days after its inception. In this way, you don’t have the worry of paying for fall-below charges. Also, with a monthly account fee of only $18, you will receive access to a myriad of additional features such as a corporate debit card, internet banking convenience and a full-fledged mobile banking app – all at no extra cost. 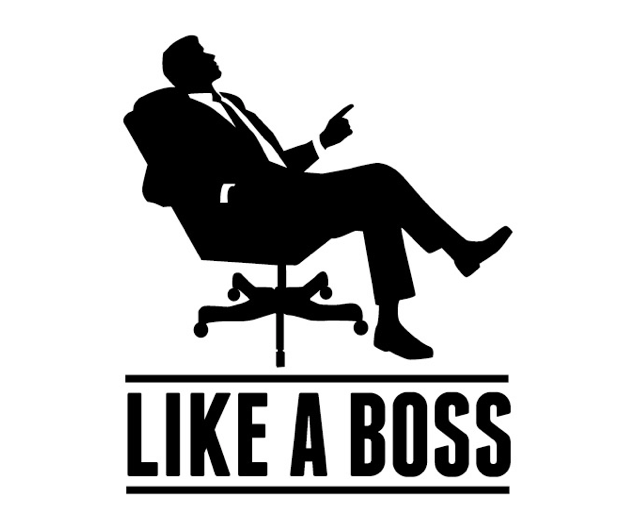 Essentially, the pay-as-you-use account allows you to ‘Live like a boss’ as they say, and concentrate more on growing your business – providing a hassle free and seamless experience. While some startup founders are industry veterans who have left their corporate jobs, there are still significant enough number of founders who are still in their 20s, especially those coming out fresh from our local universities. Young entrepreneurs definitely need all the help they can get, so having a banking partner that not only gives you a peace of mind with your finances, but also lets you learn how to grow and sustain your business will go a long way in ensuring the longevity of the company. With an app that also lets you catch up on insights and business advice on-the-go, DBS Business Class enables you access to a network of almost 17,000 entrepreneurs and business leaders in the region; with informative articles you can read, an advisor messenger service, and a community where you can seek advice from. It helps SMEs gain access to global industry leaders and get connected with disruptive solution providers through the DBS TechMatch program. You will also not just be interacting through a screen, because invites to exclusive networking events such as the DBS Bay Area Series, and Disrupt @ The Bay will also be sent to you. Oh, and if you need a more direct line to seek help from DBS’ customer service, there’s BusinessCare too, which has staff available on standby on weekdays until 8:30PM. All of us know the convenience that a full-fledged banking app can bring to our personal bank accounts, but that is sadly not the case for businesses. As up until now, traditional business accounts do not have a dedicated app, and even if they do, they are so sparse and devoid of features, you might as well just head to a bank branch. 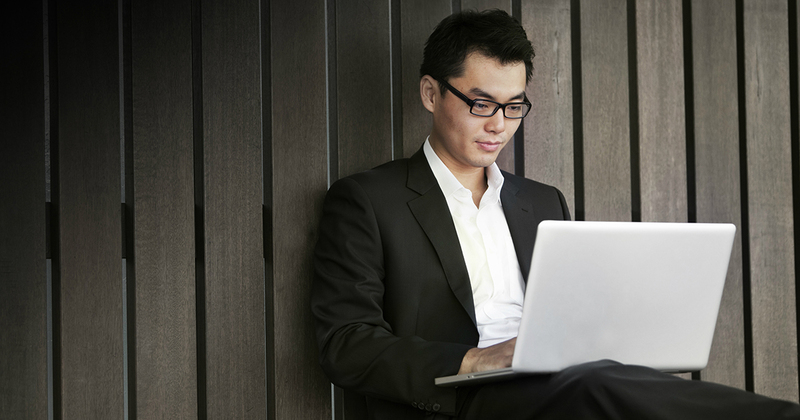 Like it or not, in today’s economy, we answer work emails on-the-go, so why not have the same benefits in business banking? At the moment, DBS is perhaps the only bank that currently offers a truly functional mobile app for your business bank account. To date, the DBS IDEAL mobile app is the only one that allows you to make account enquiries and transactions on your business account, book foreign exchange transactions, as well as give you access to subsidiary accounts both within Singapore as well as overseas. 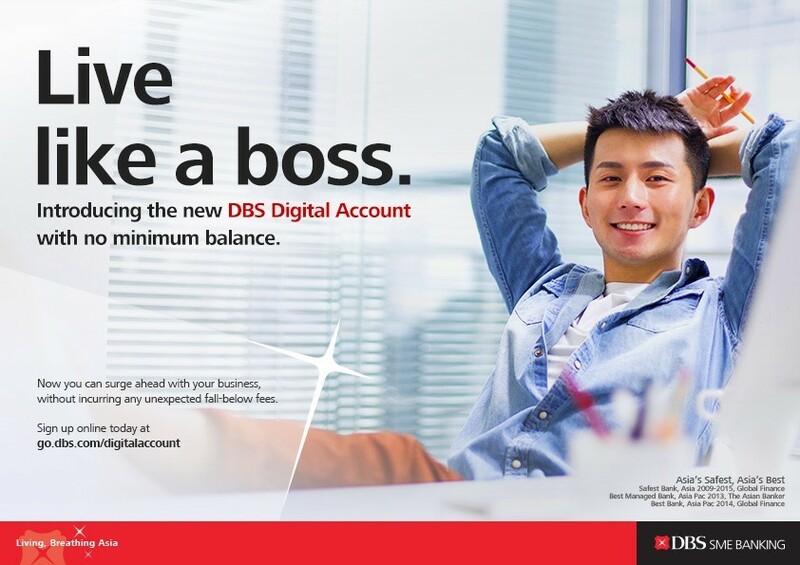 And did we mention that to open a DBS Digital Account, you don’t even have to go to a DBS branch? You can do so from anywhere that you have an internet connection, and it only takes you a few minutes. More than ever, the perfect opportunity for you to venture into the brave new world of startups and entrepreneurship is right now. 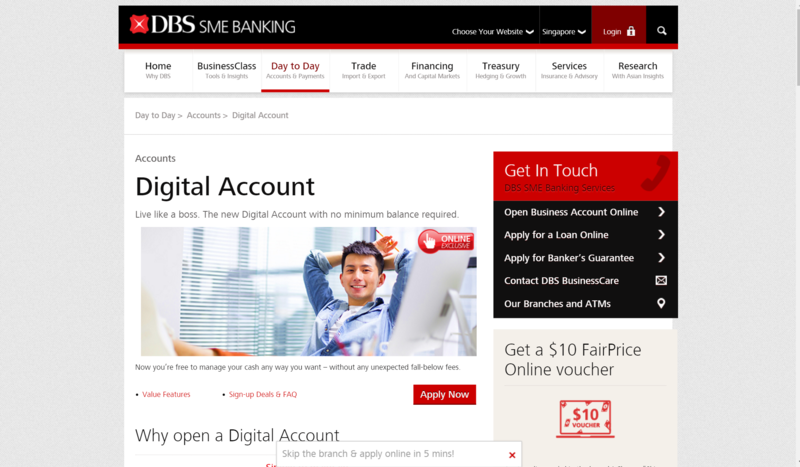 Check out DBS’ new Digital Account for SMEs here. This post was brought to you by DBS, recently named by leading finance publication Euromoney, as the “World’s Best Digital Bank” and awarded “Best Specialist Bank for SMEs 2016, APAC” by The Asset.